Happy September everyone! We only have a couple more weeks until the first day of Fall. I just wish the Tennessee weather would cooperate. I can't wait for the cool, crisp Autumn days, especially after the sweltering summer we had! My create-a-button contest entry for Brizmus Blogs Books' Japanese Friday, or Nihon no Kinyoubi, is currently tied for FIRST PLACE! Thanks to all who have voted for me so far. Voting is open until Sunday, 9/5, so if you haven't already, please go here and vote in the poll on Brizmus's left sidebar. Mine is #7. Thanks...and wish me luck! 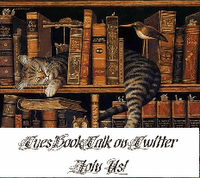 My weekly book chat on Twitter, TuesBookTalk, is still going strong. I needed an easier way to get in touch with all the members so I created a group on Goodreads. You can go here to visit (or join) or access it from the widget in the left sidebar. We are going to start discussing Labyrinth by Kate Mosse on this Tuesday, 9/7...that is, if everyone can get the book. If not, we will postpone by a week. Our first discussion will be on Chapters 1-10. Tuesday chat time is 10:30pm ET. Coming up in October, we will be having Halloween Horror Month. There is a poll up at the group so we can vote on our reading selection for that event. Who doesn't love a spooky read during Halloween?! I hope you will think about joining us, Dear readers. If you can't make the Tuesday night chat, you can go to the group and post your thoughts in the discussion thread there. Hope to see you! 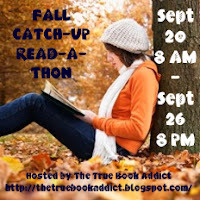 I will have the sign up post and read-a-thon info up later today for my Fall Catch-Up Read-A-Thon. I hope you will join us. It will be a fun week! Also, Banned Books Week starts that Saturday of my read-a-thon so I will have daily posts up starting Saturday and throughout the week in honor of it. Banned Books Week is September 25-October 2, 2010! Once Brooke picks her 3, I will email JennJ with the remaining choices, of which she gets to choose 2. Then, Juju will get the book that is left. Brooke, if you are seeing this post, you can go ahead and email me your 3 choices at truebookaddictATgmailDOTcom (don't worry...I'm still emailing you!) Each winner will have 48 hours to get back to me with their choices from the time I send out their email. Congrats! Thanks for reading about all my news and thank you to everyone who wished me a happy blogoversary and entered the contest. I so wish I could do a read-a-thon this fall. All my spare time seems to be going to another project that needs done but isn't nearly as fun. Happy September to you, Michelle and hoping you win!